Charlotte Tilbury is one of my favorite luxury brands and almost all of their products are truly amazing on skin. Before I start this review – Let me give you a quick introduction to my skin incase you are a new reader here. I have a combination skin. Occasionally, I get 1-2 acne that luckily fades off quick leaving red or dark brown spots. Mostly my skin is clear – thanks to wonderful skincare that I use for my everyday routine. I have pores on my skin and when I look for moisturizers or pre makeup bases – I always look for something that’d hide my pores or give my face a more refined and filtered look. When I initially saw this magic cream, I wasn’t sure If I’d try it. 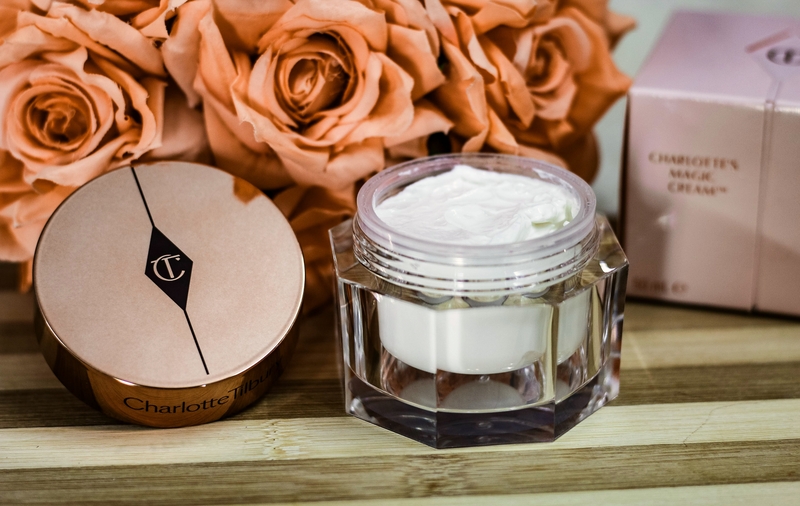 Charlotte Tilbury‘s award-winning Magic Cream was created backstage to transform models’ skin in an instant. It soon became so cult that Charlotte was compelled to ‘bottle’ her secret formula; a potent cocktail of plumping, firming and line-lessening complexes that rapidly bestows a gorgeous, runway-ready glow. This magic cream is famed for its ability to rehydrate dull, stressed, and tired skin. This nourishing moisturizer contains a new ingredient, bio-nymph peptide complex, to reduce the appearance of wrinkles and improve elasticity. SPF 15 protects from damaging sun exposure, while vitamin E, rose hip, and camellia oils leave skin dewy and hydrated. Well, quite a lot of good claims – I decided to give it a try! 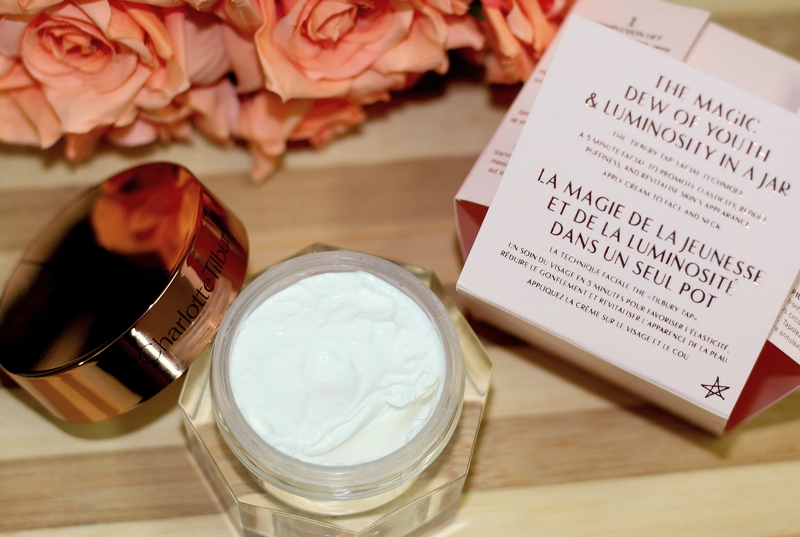 This magic cream is of 1.7 oz/ 50 mL size and comes in this luxurious tub with a rose gold screw top lid and it retails for $100/£70.00 ; The beautiful tub it comes in is wonderful, gorgeous, super luxurious and most elegant – The presentation, the outer box, the labels, everything is so adorable and feels so good! Makes it one of the gorgeously packaged skincare item in a luxury line! Now, Don’t get confused – There are two versions of this cream – One for day and one for night. The one that I am reviewing today is the day cream variant with SPF 15. Water (Aqua), Homosalate , Glyceryl Stearate SE, Ethylhexyl Salicylate, Butylene Glycol, Glycerin, Butyl Methoxydibenzoylmethane, Octocrylene, Cetyl Alcohol, C12-15 Alkyl Benzoate, Cyclopentasiloxane, Dimethicone, Phenoxyethanol, Butyrospermum Parkii (Shea) Butter, Steareth-21, Avena Sativa (Oat) Kernel Extract, Carbomer, Dimethiconol, Potassium Cetyl Phosphate, Chlorphenesin, Caprylyl Glycol, Xanthan Gum, Hydrolyzed Viola Tricolor Extract, Allantoin, Aloe Barbadensis Leaf Juice, Disodium Edta, Tocopheryl Acetate, Camellia Oleifera Seed Oil, Rosa Canina Fruit Oil, Rosa Damascena Flower Water, Sodium Hydroxide, Helianthus Annuus (Sunflower) Seed Oil, Michelia Alba Leaf Oil, Sodium Lactate, Coco-Glucoside, PEG-8, Ethylhexylglycerin, Sodium Hyaluronate, Tocopherol, Palmitoyl Oligopeptide, Palmitoyl Tetrapeptide-7, Ascorbyl Palmitate, Plumeria Rubra Flower Extract, Ascorbic Acid, Citric Acid, Nicotiana Sylvestris Leaf Cell Culture, Linalool, Citronellol, Geraniol. With all the hype surrounding this cult product created by Charlotte Tilbury, one of the top make-up artists in the world, Charlotte Tilbury. I must admit I’ve been dying and waiting to try this wonderful formula. The texture of this cream is very rich and quite thick. Like how it is designed to be – It’s meant to be applied through a facial massage. -Apply Magic Cream to your fingertips, and smooth onto skin starting from the lower cheek and moving upward to stimulate circulation. -Tap your cheeks and under the eye area to decongest puffiness. -Massage into your forehead using circular motions and sweep outward toward the temples. -Smooth your fingers under your cheekbones and jawline, sweeping upward to define contours. Here’s a video of Pro-Collagen Wonder Workout using Magic Cream by Charlotte Tilbury. Also, keep in mind that this is not amongst one of those creams that instantly sinks into your skin upon application. It takes several minutes(about 10 minutes or so) to get completely absorbed on the skin. Yet, not heavy on skin, still I find it a tad bit greasy on oily skin. My sister who have oily skin didn’t like the feel of it. For me, with a combination skin – Found the formula to be comfortable. And I feel this cream is best for colder months where your skin tends to be on the drier side. If you live in a very sultry and humid climate, It’s better you don’t try this. Also, if you are someone with dry – extremely dry skin, you’ll most likely love it. I wouldn’t recommend this cream to oily skin people as it might leave too much of a shine on oily skin. It has a floral fragrance to it and also comes with sunscreen SPF15. I noticed after the cream sinks into my skin – The skin appeared more luminous and softer. It’s non sticky. Skin feels instantly smooth to touch and dewy after application. But, the makeup products quite easily applied on top of this and I never found it tugged or pulled my skin, Neither it slipped off my base makeup products. If you have a dehydrated skin like mine – You will love this. Especially that plumped and luminous feel instantly takes away all those tiredness off your face. Your face looks as if you had a good night’s sleep. 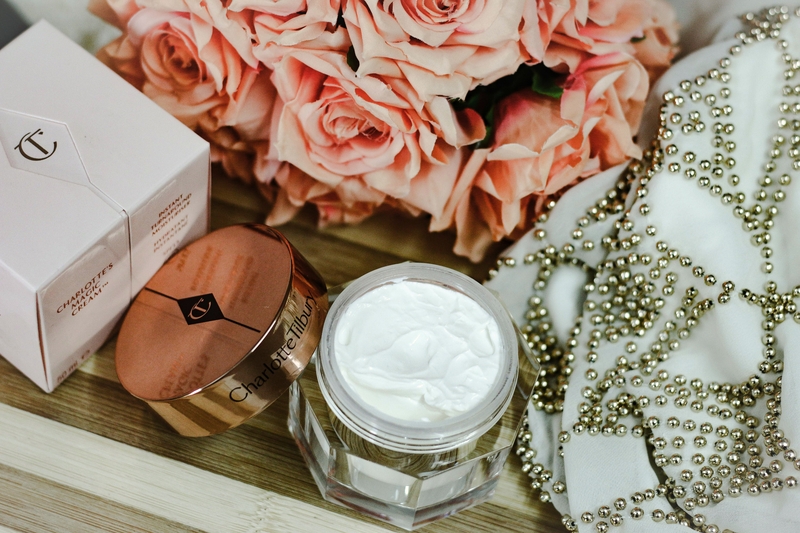 Also, if you like that dewy, radiant looking skin – This cream is perfect. Don’t hope or expect any miracles or any sort of dramatical change to your complexion or a skin condition. If you are hoping for a change on your skin condition or any miracles – Give it a pass. It will not erase wrinkles, blemishes or acne scars or make your spots disappear. This just moisturizes and illuminates the dry skin area or I would frame it like this – Prepping your skin beautifully for your makeup. It filters the fine lines under your eyes or smile line areas cased by dehydration etc. More than a moisturizer – I like to use it as a primer. In my last review post – Some of you had commented saying you guys’d love to see a ingredient checkup. So, I thought its great to start with this one. Let me go by the main ingredients – bio-nymph peptide complex – Reduce the appearance of wrinkles and improve elasticity ; SPF15 – This Magic Cream has a SPF15 and a anti-UVA filter. Sodium Hyaluronate – It forms a film of hyaluronic acid on the skin and locks in the moisture. Result is plump and more youthful looking skin. vitamin E, rose hip, and camellia oils leave skin dewy and hydrated. Now, some of you might have this question in mind – Did it do anything for the pores – Did it help with pores – reduce the appearance of pores – Well, answer is It did ; As I said earlier. It did it’s job of a skin filter primer. As my skin felt luminous, more plumper, reduced redness around my nose. And yes – the pores calmed down a little. It sort of filtered my skin and the pores reduced it’s appearance. My little tip to a flawless skin when applying makeup and to shrink pores is – Use a clay mask before applying makeup. It tightens your skin and then once you wash off mask – Use this cream. Do a light facial massage, Leave it for several minutes for it to sink completely onto your skin and then do your makeup. You will notice that your makeup is much more long lasting. It didn’t give me any breakouts. Neither did it clog my pores. 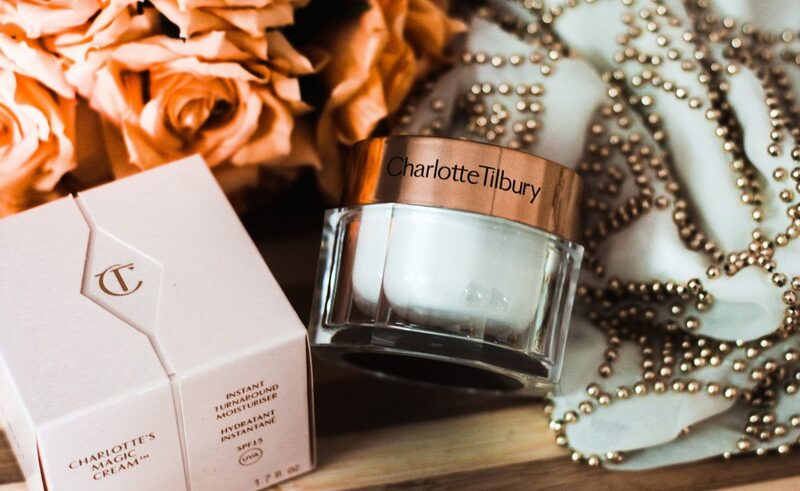 Whether you’re stressed at your desk, dehydrated after a long-haul flight or an all-night hedonist with hungover skin, cheat the appearance of 8 hours sleep with CHARLOTTE’S MAGIC CREAM, for a lasting dewy, plumped-up finish. Skin is left hydrated without feeling heavy or oilness in the T zone. And, like I mentioned earlier – This is an awesome pre-makeup moisturizer or base and a very little goes a long way. Even with daily use, a jar should last a very, very long time. Don’t hope or expect any miracles or any sort of dramatical change to your complexion or a skin condition. If you are hoping for a change on your skin condition or any miracles – Give it a pass. It will not erase wrinkles, blemishes or acne scars or make your spots disappear. This just moisturizes and illuminates the dry skin area or I would frame it like this – Prepping your skin beautifully for your makeup. It filters the fine lines under your eyes or smile line areas cased by dehydration etc. More than a moisturizer – I like to use it as a primer. 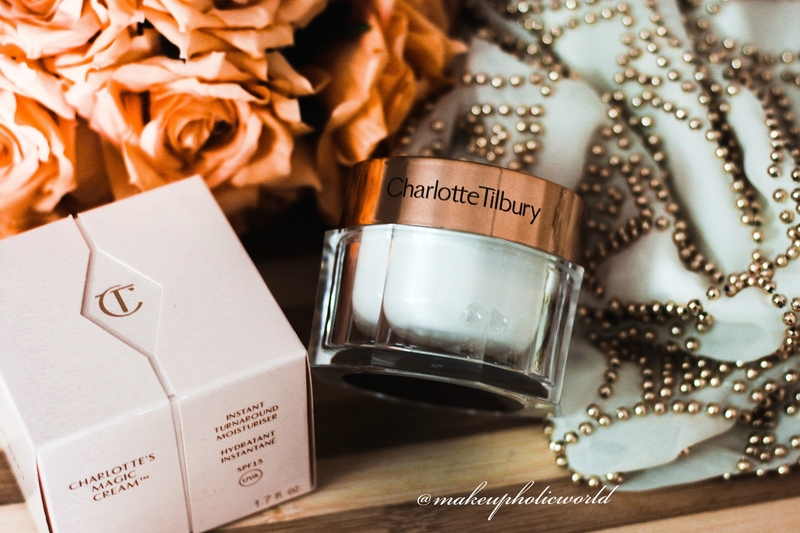 Have you tried Charlotte Tilbury Magic Cream ? What are your thoughts about it ?